during 2006 war. (Source: National Geographics). 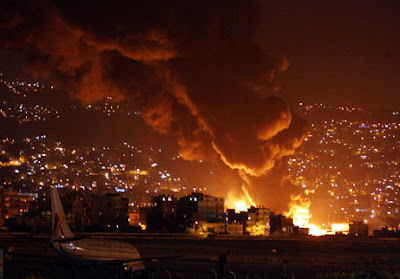 It seems that time is ripe for the next Israeli war on Lebanon. It might not take place within the next few days or months, but it is definitely on the horizon. On the eve of two major events; the Israeli elections taking place on the 10th of February and the first commemoration of the assassination of Hezbollah’s “commander in chief” Imad Mughnieh, the situation is worrying, dangerous and more volatile than ever. The pieces of the puzzle start with the declarations coming from Teheran last week. Meeting with Iranian Air Force commanders, Ayatollah Ali Khamenei declared that “Iran's Islamic Revolution has been the source of great political changes”. He added that the "The popularity of the message of the Revolution can be clearly witnessed in what happened in Gaza, and before that in the 33-day war in Lebanon. The well-equipped Israeli army backed by the US was incapable of defeating a handful of besieged youth who had nothing but their faith in God." When Ayatollah Khamenei mentions the popularity of the Islamic Revolution outside the Iranian borders, we are automatically redirected to the classical Iranian dogma of "Exporting the Revolution". The Iranian establishment seems satisfied with the spread of its doctrine abroad, specifically in Lebanon and the Palestinian Territories. The echo of such perturbing declarations is heard in Beirut, where the Iranian fist is strongest. On the 16th of February, Hezbollah is organizing a massive rally to commemorate Mughnieh. Leaked information already suggests that "There is no other way but a revenge equal in its magnitude to scale and meaning of Haj Raduan’s (aka Mughnieh) assassination". Hezbollah officials have been reported saying in private circles that "The planned reprisal act will surprise Israel on many levels, and that Israelis should pay in order to refrain from assassinating other leaders". Hezbollah is indeed an expert at surprising the public opinion and Israel. The party promised and delivered on many occasions. However, Israel’s reaction will not come as a a surprise to anyone this time, and the Party of God knows it well. This time, Hassan Nasrallah cannot tell us what should not have been said after the 2006 war, when he declared: "If I only knew the scale of the Israeli retaliation I would not have ordered the capture of the two Israeli soldiers (operation Honest Promise)". Since Lebanon is officially at war with Israel, and since the military balance of power is in Israel’s favor in terms of fire power, the Israeli Ministry of defense has always handy in its drawers a draft plan for an eventual war on Lebanon. If we go back in time, a dangerous precedent shows how Israel can use any pretext to start a war when it needs it. For example, in 1982, the Israeli invasion of Lebanon started "in response" to the assassination attempt against Israel’s ambassador to the United Kingdom, Shlomo Argov. After it failed in achieving its goals in the 2006 war; after the Vinograd commission report and its impact on troops morale, Israel is in desperate need for a war that will restore its lost supremacy. Such would be the plan of a future Likud government. Hezbollah, from his part, appears ready to fulfill the promise by inflicting a painful revenge on Israel no matter what the result is, even if the price of Mughnieh’s blood will end up being paid by thousands of Lebanese lives. Finally, and by giving the order for the so called spectacular revenge, Hassan Nasrallah will give Tel Aviv a rare opportunity, while the best strategy would be to leave it stuck in the post Lebanon 2006, and Gaza 2009 era of failed wars.